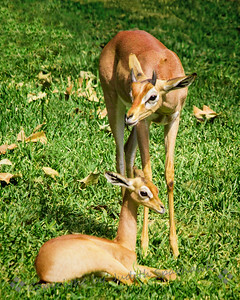 These Southern Gerenuks were part of a small herd at San Diego Safari Park. I liked the look of the cute little one. 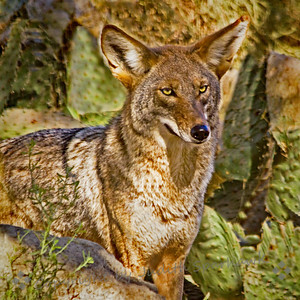 This coyote appeared to be hiding behind a rock and in the cactus, using it as a lookout. He has a very intense look on his face. I loved the nice red cast in this coyote's coat. The Living Desert, Palm Desert, CA. 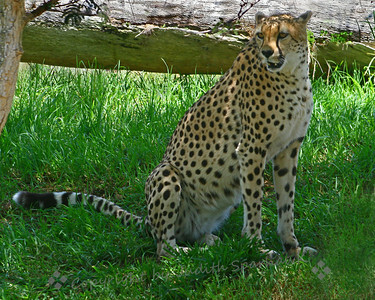 This shows two of the three cheetahs at the Living Desert in Palm Desert, CA. The keepers give them a chance every day to run in their enclosure. 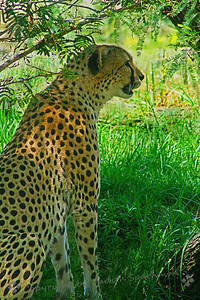 Cheetahs are known to be the fastest animal on earth, so it wasn't easy to capture them (I got several shots with just tails in them! ), but this shows at least two of them. They are such beautiful animals. 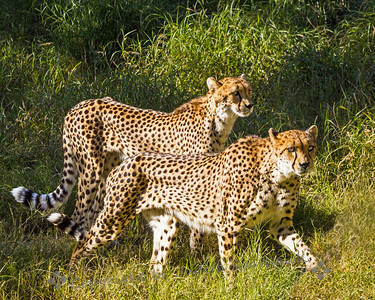 This shot makes it look as if the two cheetahs have a real purpose and goal in mind as they walk in the grass. The Living Desert, Palm Desert, CA. 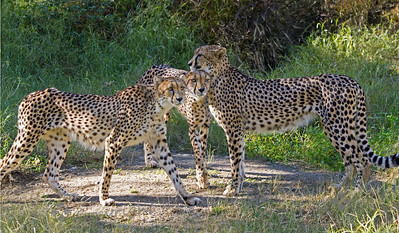 All three cheetah sisters in one shot. It was nice to capture the interaction between them all. The Living Desert, Palm Desert, CA. 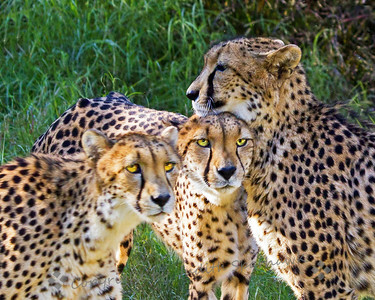 Although it was difficult to get all three of the cheetahs in one shot, it worked for this one. This is a crop of the original image. 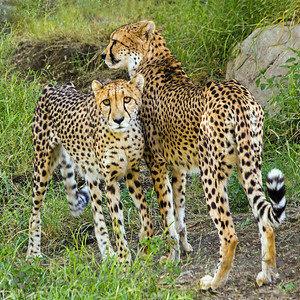 Two of the cheetah sisters at the Living Desert, Palm Desert, CA. 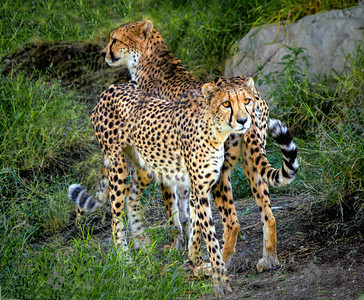 These two Cheetahs were photographed at the Living Desert in Palm Desert, CA. 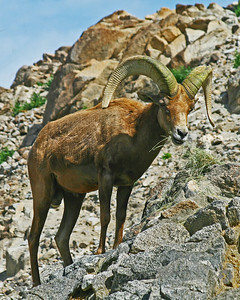 This is a female sheep at the Living Desert, Palm Desert, CA. 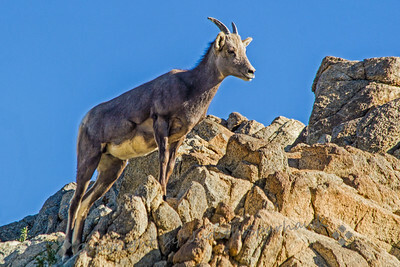 I liked her pose at the top of high rocky cliffs. 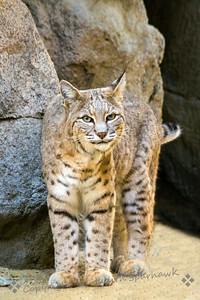 I thought this view of the Bobcat seemed to be was really looking right at me. Living Desert, Palm Desert, CA. I visited the Living Desert in Palm Desert, CA today. 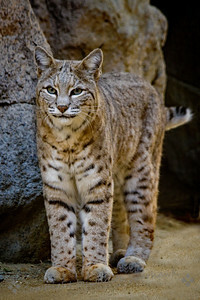 This Bobcat was so cute, with its funny smile, I couldn't resist--it has a little "smug-mug". 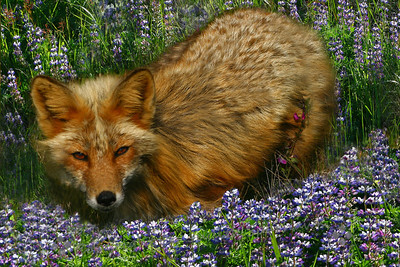 Red Fox in the Lupine ~ This fox was photographed on San Juan Island, in the Puget Sound, WA. I loved his deep amber eyes. After he studied me awhile, he hopped up on a split rail fence and walked off on top of the fence. 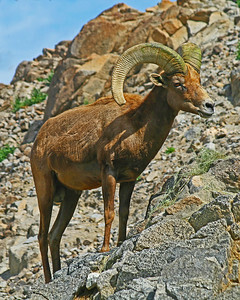 This view of the male sheet on a rocky hillside was photographed at Living Desert in Palm Desert, CA. 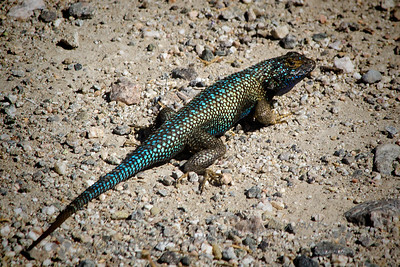 I'm not too big on photographing reptiles, but I was surprised to see this one with its bright turquoise spots. Researching it, I believe this is a Western Fence Lizard, a species that can be quite varied in its markings, and are fairly common in western deserts. 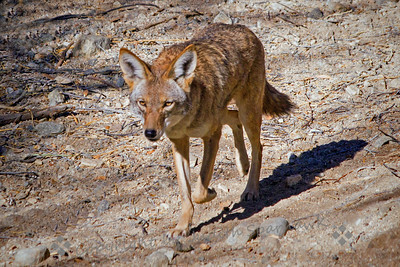 This was seen at Whitewater Canyon Preserve, a desert canyon between Palm Springs and Joshua Tree National Park. 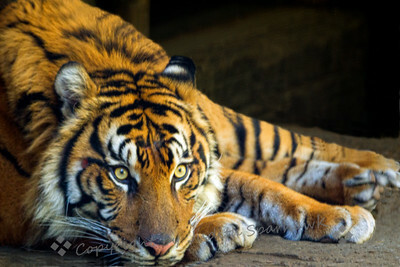 This resting tiger looked a little strange, maybe sad?? Maybe he was just resting up for some future play. 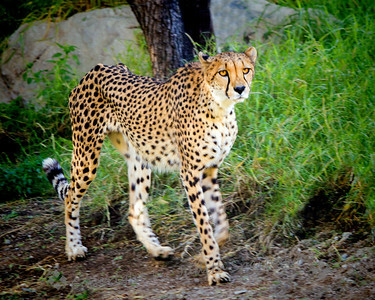 I photographed him at San Diego Safari Park. 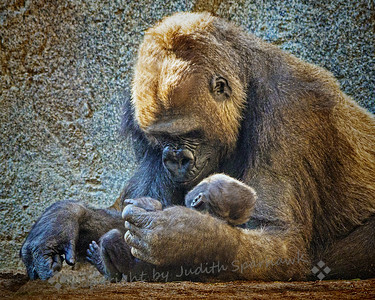 Another Momma gorilla and baby image. I liked this one because she seemed to be gazing adoringly into baby's eyes. Safari Park, San Diego, CA. 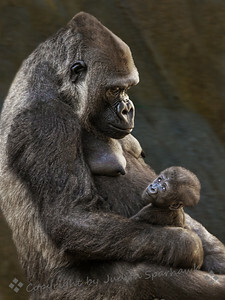 A different view of Momma gorilla and her baby, who seems to be looking right into the camera lens. San Diego Safari Park, San Diego, CA. 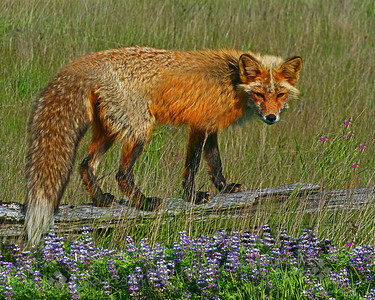 This Red Fox was photographed on San Juan Island, in the Puget Sound, Washington. He walked across the meadow, seeming curious, and then hopped up on the fence and walked away. He did look back at me a few times, so I waited with my camera as he went.